Summary report of the 5th Edition of the Waterbird Population EstimatesArabic language identification guide for migratory waterbirds in Northern AfricaIdentifying and counting waterbirds in AfricaTraining in data management & GISThe "Flyway Training Kit"The "CSN tool"
This booklet aims to present the current knowledge of the population estimates, trends and conservation status of waterbird populations in different parts of the world in 2012. 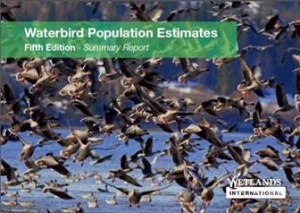 It is a summary version of the fifth edition of the Waterbird Population Estimates (WPE5) which has been published as a web-based, open access, interactive database (wpe.wetlands.org). 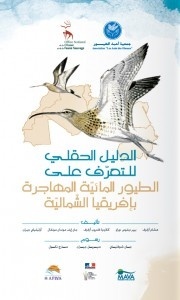 The new identification guide to waterbirds in Northern Africa in Arabic language was presented to the public during a workshop organized by the Association « Les Amis des Oiseaux » (AAO) in Tunis on 2 March 2013. Richly illustrated, the small pocket guide allows the identification of 200 waterbird species recorded in the region from the North of Sudan to Mauritania, passing through Egypt, Libya, Tunisia, Algeria and Morocco. Each species is presented with its vernacular Arabic names used in the 7 countries, drawings and texts of identification, a map of distribution as well as information on its status in the region. 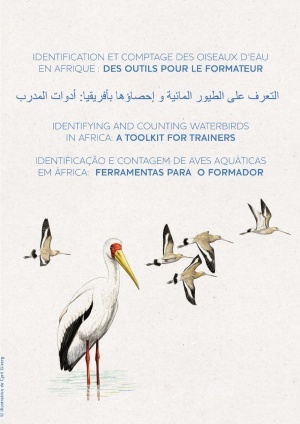 This guide particularly aims to stimulate the International Waterbird Census in the region and is a contribution to the implementation of the African‐Eurasian Waterbird Agreement (AEWA) and in particular the African Initiative which aims to promote this agreement on the African continent. The guide was developed in partnership between AAO and the National Office for Hunting and Wildlife in France (ONCFS) with the financial support of the French Ministry of Ecology, Sustainable Development and Energy and the MAVA Foundation. and one for Sub-Saharan Africa. Modulo 5:Contagem ou estimar ? Created by ONCFS and Tour du Valat, this training course enables participants to understand the importance of each step in the chain of data processing, from species identification with the estimated numbers when counting on the field up to the input and the promotion of data through their map making. All of these steps enable national and international scientific programmes to capitalize acquired information and promote it, for example through the identification of sites of international importance for waterbirds. For more details, contact Clemence Deschamps (deschamps@tourduvalat.org). 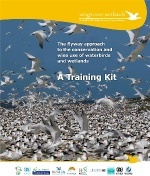 ● The "Flyway Training Kit"
This conservation tool created by Wetlands International and its partners, developed under the WOW project aims to strengthen the capacity planning and implementation of actions, monitoring and conservation of migratory waterbirds and wetlands across migration routes in Africa and Eurasia. The training can be downloaded from the project website wow.wetlands.org. 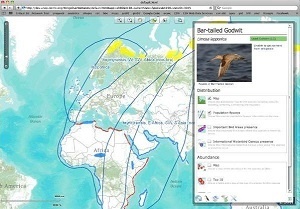 The Critical Site Network developed under the WOW project is a online resource for the conservation of 294 species of waterbirds and the sites on which they depend in Africa and Western Eurasia. International conservation organizations working for the protection of waterbirds and their habitats have joined their forces to develop this tool to strengthen the implementation of AEWA and the Ramsar Convention. Additional information is available on the project website wow.wetlands.org.